vintage fabric pillow & my first show! I am so excited- shortly before I was going to post today I got word that I was accepted into my first show of the year! Check that goal off the list for 2011! Yahoo! I was busy making this pillow last night. My intention from the beginning was that it would be going up for sale. Let me tell you- I am so in love with this fabric!! I definitely will be making some for myself! I found a vintage flat sheet at one of my favorite thrift shops, and the turquoise flowers had me instantly. Bonus points for the lovely edging that I was able to cut off and use for embellishment. This large lumbar pillow is super comfy. I added the ball fringe that I absolutely adore. I add it to so many things in my own home, because I find it so charming. 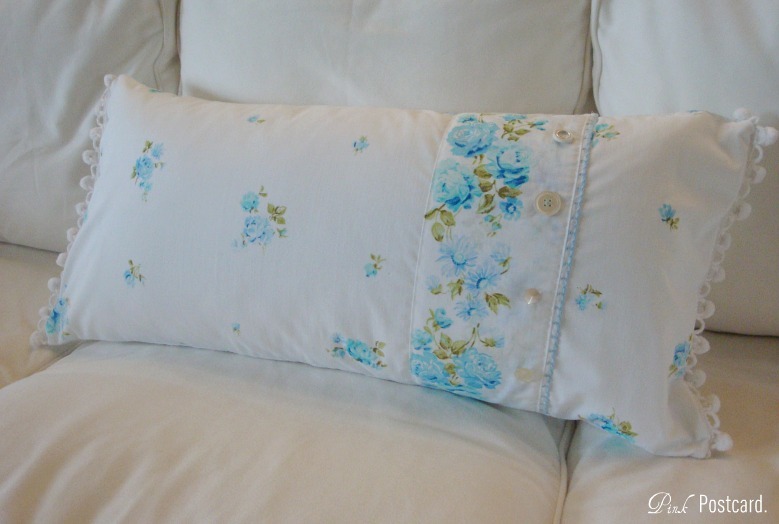 Like I said before, I was able to use the top edge of the sheet to embellish the pillow- loving the embroidered edge and spray of flowers. I also added some vintage buttons to it. My plan is to also make some square pillows in the same fabric. I have several turquoise items that this will look great with in my space for the show! Here's the promotional flyer that I received. I will be posting an admission coupon on my sidebar shortly. This will be a super fun event in a gorgeous space! 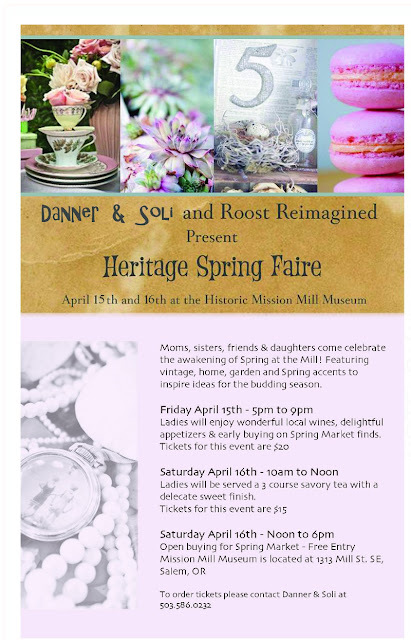 If you are local, I hope to see you there! Um, that is like the most perfect pillow I have ever seen!! You rock. 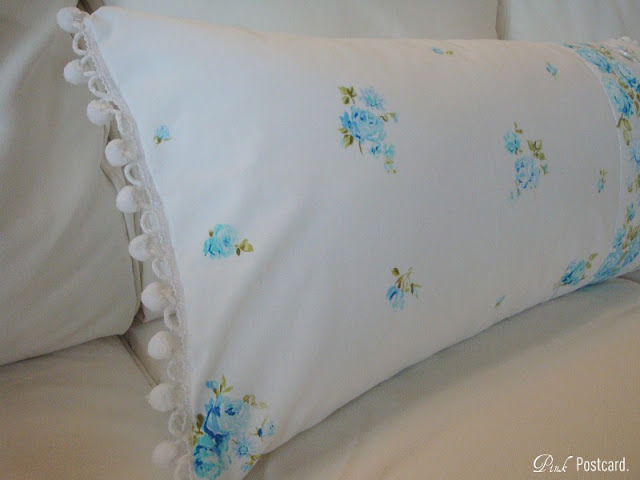 That is one cute Shabby Chic pillow! I think I started following your blog over a pillow you made. Love it! Congrats on the Show! I'll be doing my first one towards the end of April. I'm excited to see what yours looks like. Have fun! Denise, the pillow is beautifully done! I am so impressed with your sewing talents! Congratulations on the show! I wish I was still there, as I'd certainly attend. aww it is sooo cute! Its very pretty and you did a amazing job. I love it! i know ur booth will b fab! the fabric is so sweet and u did an amazing job on the pillow. Prettiest pillow on the planet! I LOVE it! Congrats on getting into the show too! your pillow is adorable...i just love the turquoise flowers!! congrats on the show, it looks like it will be so much fun with lots of cute goodies! I love this! There is nothing like a good vintage sheet or pillow case. They don't make them that soft nowadays! sweet, sweet, sweet!! and congrats on being in the show! Denise, that is so so lovely! What a keepsake, I absolutely love the fabric! Thank you for joining the spring projects party! What a pretty pillow. I'm forwarding this page to a friend who loves to make things with vintage sheets. What a darling pillow Denise- you did a fantastic job on it! 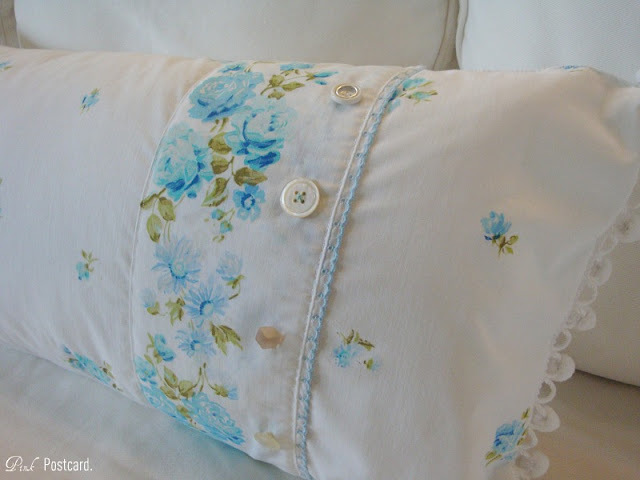 I love the sweet trim you added too- I see those pretty old sheets at the thrift stores all the time... I will be re-imagining them as pillows now! lol! Thanks for the inspiration and thanks for sharing at FNF! Congrats on the show too!! Ohhhh this gorgeous project gave me a smile. You see, I have the same vintage sheet from my mom with pink roses. :) Now I know what to do with it! Visiting from FJI. This is just so pretty. I love the addition of the pom pom trim. The edge of the pillow was a great addition. I will be looking at old sheets at the thrifts more closely now! I simply adore this pillow...looks so comfy. The color is great. Was definitely an awesome find. That pillow is so gorgeous, love the fabric!